Brighton could become the first city in the UK to provide rooms where people would be able to use illegal drugs safely without the fear of prosecution. Their use is one of the recommendations in an independent report commissioned by Brighton and Hove City Council. 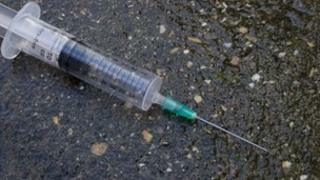 The aim would be to reduce drug-related deaths in a city described as having had "a drug abuse problem for decades". But critics said the move could amount to colluding with poor lifestyle choices, or even illegal behaviour. Sussex Police welcomed the report but emphasised the importance of a "holistic approach" to illegal drugs. The research by the Independent Drugs Commission for Brighton and Hove proposes providing consumption rooms - often referred to as shooting galleries - where people could use their own illegal drugs under the supervision of professional healthcare workers. They would provide medical care if required. The intention is to reduce the risk of overdoses and other drug-related deaths, as well as decreasing the amount of drug-taking on the streets of Brighton. It also suggests making Naloxone, a prescription drug which can prevent fatal overdoses, directly available to users. Services for young drug takers should also be separated, according to the report, to prevent them mixing with older, more established users. Mike Trace, vice-chairman of the commission, told BBC Radio 4's Today: "We have said to the authorities in Brighton that you need to look at this because it's something that could reduce drug-related deaths - which is an issue in the city - but also because it could take a lot of public drug use and drug markets off the street." He said there were various models that could be adopted - for example drugs provided by medical professionals, or users buying illegal drugs and using them in the rooms. However, there was a "grey area" over whether a law change would be required for this sort of service, he said. Councillor Rob Jarrett, chairman of the council's adult care and health committee, said the area had had a problem with drug abuse "for decades" and the council would take the recommendations "very seriously". But Chip Somers, chief executive of Focus 12, an abstinence-based rehabilitation centre, told the Today Programme: "We've got the balance between providing addicts with care and harm reduction techniques completely out of proportion and we're now colluding with really quite poor lifestyle choice and in this case illegal behaviour." The potential cost of any such project has not been revealed - but Mr Somers said it would be "very expensive" and "for that sort of money you could put 40 or 50 people through a complete rehabilitation project". Nic Newman, a recovering addict, warned there could be a risk that addicts would be encouraged to use drugs more than they would have otherwise. "Some people might take more risks if [they are] in a clinic with a managed room. With nurses on hand I can push the boundaries a bit more, can't I?" he told BBC Breakfast. The commission consists of 10 local experts - including Kate McKenzie, mother of recovering drug addict Hannah McKenzie - who have been working over the past year on recommendations to reduce the dangers of drugs in Brighton. More than 60,000 people in Brighton and Hove, which has a population of just over 270,000, have used drugs, according to the commission. They include more than 2,000 problem heroin and cocaine users. For several years Brighton had more drug-related deaths than any other city in the UK - in 2000, 67 residents died from drug misuse. In 2011, Brighton saw 22 drug-related deaths - nine per 100,000 people over the age of 16 - making it eighth in the table of UK drug-related deaths. Ch Supt Nev Kemp, divisional commander for Brighton and Hove, welcomed the report, adding the recommendations would be discussed. Decriminalised consumption rooms are in use in Germany, Luxembourg, the Netherlands, Spain, Norway, Switzerland, Canada and Australia. In the UK, King's College London is carrying out a study on administering diamorphine (medical-grade heroin) to addicts to reduce heroin use. In Vancouver, a facility named Insite allows users to take their own drugs in a supervised environment. It has operated since 2003 under a constitutional exemption from Canadian drug laws.